In a move that has made Opposition Congress raise eye-brows, Gujarat chief minister Vijay Rupani has begun consultations to appoint parliamentary secretaries, allegedly to manage "growing dissent" in the party because of failure to satisfy all the groups -- caste and regional -- seeking ministerial berth. Talking with Counterview on the sidelines of a media conference on the issue, Congress' all-India spokesperson Shaktisinh Gohil revealed, things have gone so bad that BJP MLAs have been frankly discussing with Congress leaders about how Rupani is trying to assuage the MLAs' dissatisfaction by making this offer. "At least two senior BJP MLAs, whose names I would not like to reveal, have approached me to find out whether the offer, if accepted, could be challenged in the court of law. I have told them, in the light of the Supreme Court judgment of July 2017, no state government can appoint parliamentary secretaries. The judgment bars states to even enact law on this", Gohil said. If the ruling party's appoints parliamentary secretaries, it would be considered is illegal, as under the law, it cannot appoint more than 15% of its MLAs' strength as ministers. Holding the office of parliamentary secretaries over and above the 15% MLAs' strength would amount to giving them the right to enjoy salaries and perks equal to a minister, as also peruse files. The MLAs as parliamentary secretaries would, therefore, be holding "office of profit", as their appointment would be in conflict with their duties and interests as elected members. Himself a senior Gujarat High Court advocate, Gohil said, "I warned these MLA, that if Rupani decides to appoint them as parliamentary secretaries in Gujarat, I would challenge it in the court, as it would be a contempt of the Supreme Court judgment. The judgment is absolutely clear: It bars any such appointments under whatever circumstances." Pointing out that he has already written a letter the Gujarat governor telling him how the move is "undemocratic and unconstitutional", Gohil insisted, "The governor should not allow the chief minister to go for this undemocratic and unconstitutional extension of his government." "In my letter to the governor, I have placed all the legal facts as elaborated in the Supreme Court judgment and constitutional amendment", he said. The Supreme Court judgment was in response to a 2005 public interest litigation (PIL), in which a three person bench ruled that the concept of parliamentary secretary with powers and salaries like minister was unconstitutional and state governments have no power to frame any law about this. I will surely win the case." Gohil's tough stance comes amidst a raging controversy around the Election Commission of India (ECI) disqualifying 20 Aam Aadmi Party MLAs as they were appointed parliamentary secretaries by Delhi chief minister Arvind Kejriwal in "violation" of the apex court order. 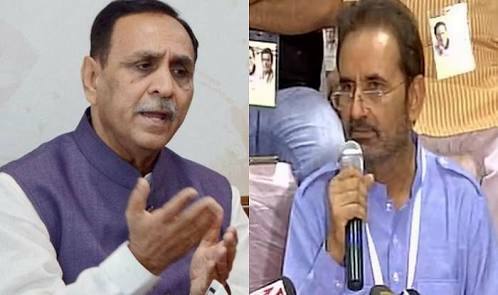 The previous Gujarat government, also under Rupani, had 11 parliamentary secretaries. Addressing the media for the first time after his surprise defeat in the Gujarat state assembly elections, held last month, Gohil said, "Jumbo ministries have become a matter of the past as both the houses of Parliament passed a bill restricting the size of the ministry to 15% of the total number of MLAs of a state." "This has been made a law as the President has cleared it. Now, no government can appoint parliamentary secretary, nor it can have ministers more than 15% of the strength of the House", the senior state Congress leader said, adding, "Despite such clear picture, the Rupani government is planning to induct parliamentary secretaries."